I love brunch. 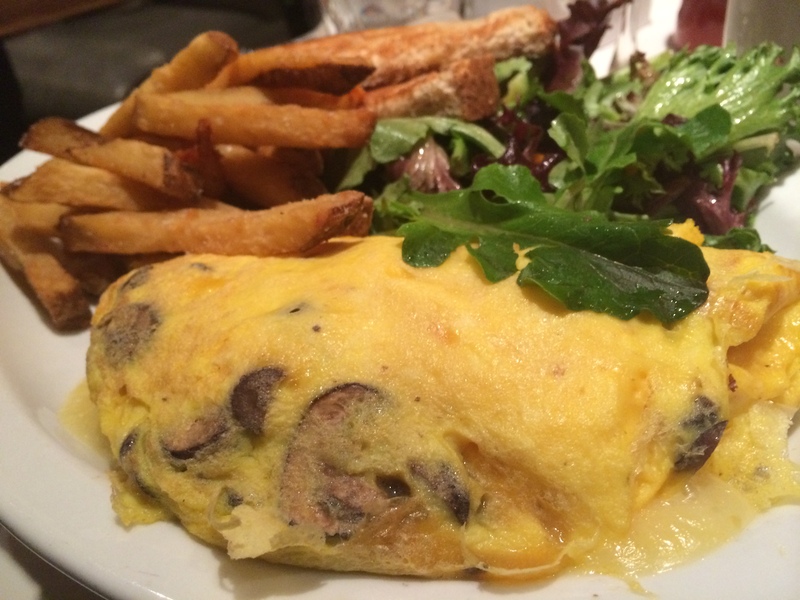 Everything from pancakes, to french toast, omelets and even the occasional burrito. All topped off with a mimosa. I mean, what could be better on a Sunday morning? In addition to loving brunch, I also love trying new places for brunch. 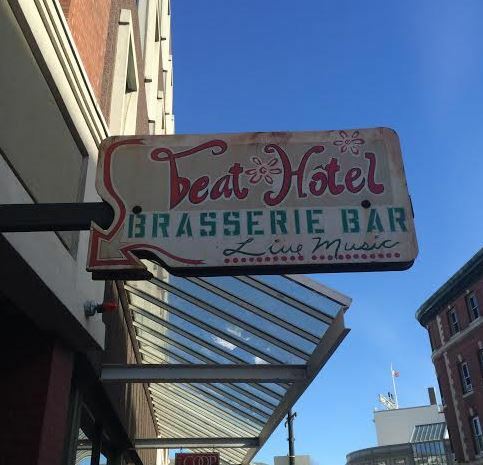 When the Boston Brunchers had an upcoming event at the Beat Brasserie (aka Beat Hotel) in Cambridge, I jumped at the chance. I used to go to Boston Bruncher events pretty often. When I got a job and moved to New Hampshire, they became further between, mostly because getting to the city on a Sunday morning is usually on the tough side. But this particular Sunday, which also happened to be the same day as the Super Bowl, it was perfect timing. Fiance (I love calling him that…) slept in, while I got up and headed to Cambridge. As I drove down, I realized the last time I went to a Boston Bruncher brunch was 2 full years ago! Definitely not letting that much time pass between these brunches again! 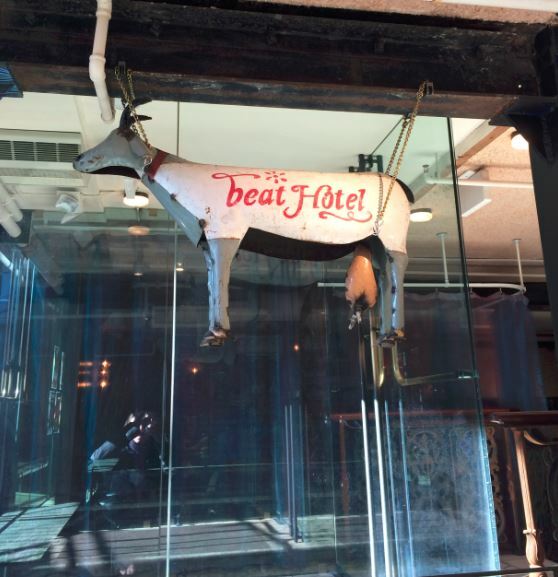 I was the first to arrive at the Beat Brasserie and took in the atmosphere. It had an eclectic, yet cozy feel that I immediately enjoyed. Chandeliers of merlot-colored beads hung draped around the restaurant providing a warm glow, and there was an empty band set up at the very back of the floor that would eventually have musicians behind it to play for us while we ate. I sat at a table with Lianna, Taryn and Melissa. 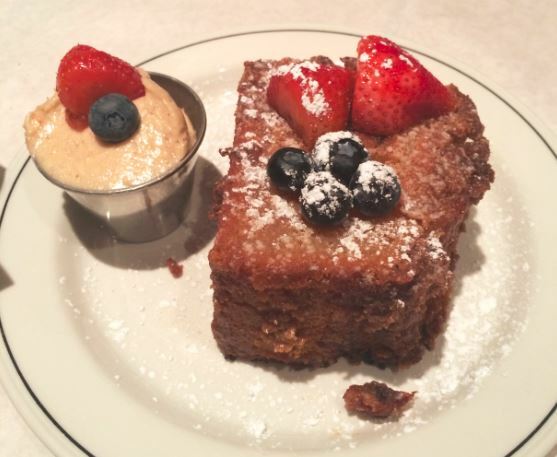 We decided to order a bunch of things for the table and share, starting with the Caramelized Apple and Cranberry Coffee Cake. This cake was everything I wanted in coffee cake and more. It was super decadent and rich, but the flavors of the apples and cranberries really came through. I could’ve eaten the entire piece by myself with no problem. It also came with a dollop of cinnamon honey butter which was like an added layer of crack onto this already addicting slice of heaven. I also went with a traditional mimosa as my drink of choice. Normally, I try to order a specialty house drink when I am at a new brunch place but was feeling like a tried and true brunch staple that day. It did not disappoint. I had two. And maybe four cups of coffee. And a gallon of water. I don’t think my water glass was ever empty. Needless to say, I was hydrated and the staff was really conscious and helpful. It wasn’t long before we had an entire table covered in food. 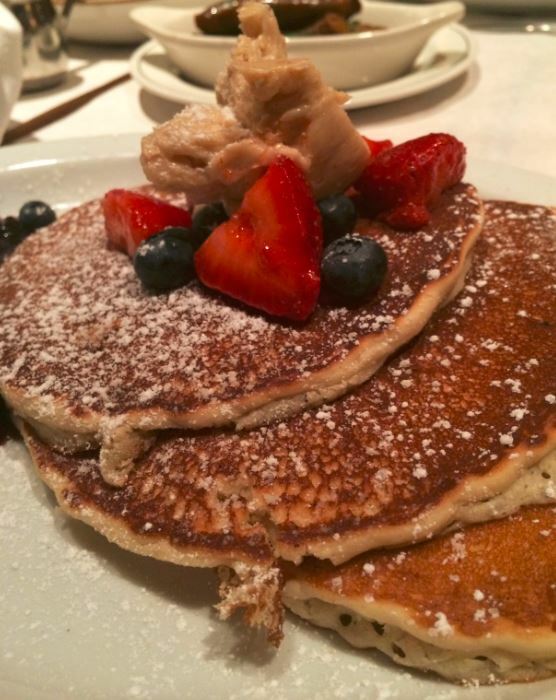 The pancakes were light and airy, and came with a sweet berry compote that complimented the pancakes nicely. There was also a spoonful of the same cinnamon honey butter from earlier on top, but the pancakes were so flavorful and pillowy on their own, I didn’t think they really needed any extra butter. However, getting a bit of pancake and berry compote together in one bite was pancake heaven. The omelet was good; I’m always a sucker for fontina cheese, but slightly underwhelming compared to the pancakes. 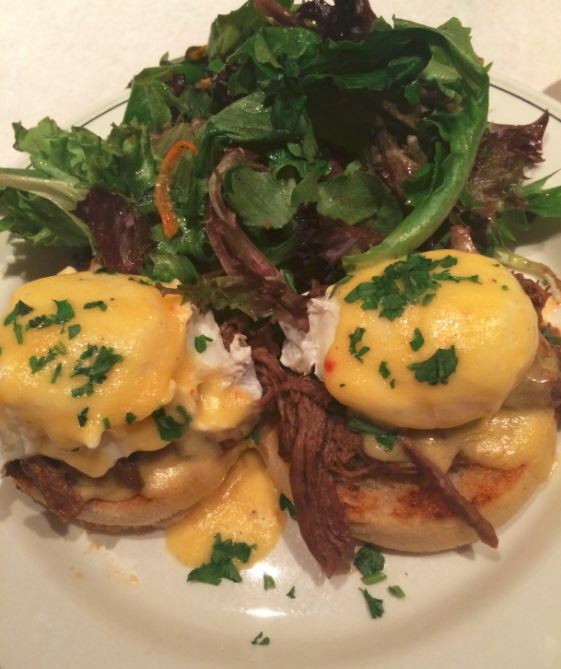 By far, my favorite was definitely the Eggs Bennie, and it was a hit among my co-brunchers as well. The braised short ribs were buttery and rich, the egg perfectly poached, and the side salad was dressed just enough (no one likes soggy salad.) It was an innovative take on one of my all-time favorite breakfast foods and certainly did not disappoint. 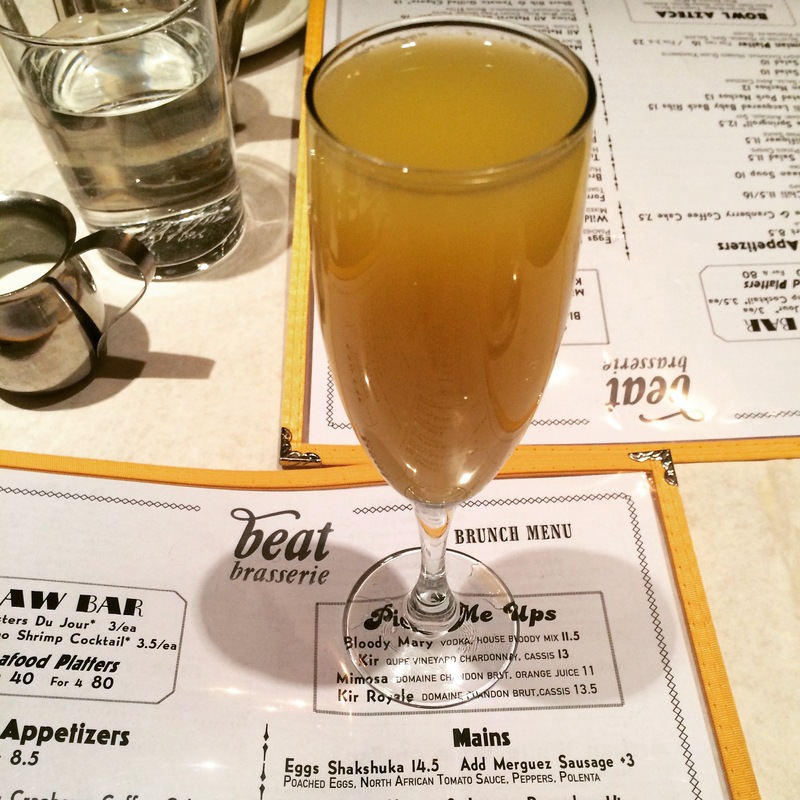 Have you tried the Beat Brasserie for brunch? What was your favorite thing on the menu? Disclaimer: Brunch was provided to me free of charge in return for my review. But, as always, all opinions are my own.